Red Needle Cast (RNC) is the latest in a suite of needle diseases that cause concern to radiata pine growers. It is caused by a Phytophthora, Phytophthora pluvialis. P.pluvialis is water-borne, and the wet winter and spring of 2017 meant the geographical extent and severity of RNC was greater than ever before. RNC has a very rapid infection cycle. Trees are infected through the stomata on their needles. The disease does not penetrate vascular tissue. It sporulates on the needle surface, which means it is susceptible to environmental and chemical control. 0% in Year 3 (if no further defoliation occurs). pluvialis does not survive on logs, so there is no risk to the overseas log trade. pluvialis does infect Douglas-fir, so Douglas-fir is not a risk-free alternative in areas prone to RNC. Copper has been identified by Scion as the most promising alternative. Copper is cheap, has low environmental impact, and is familiar to the industry thanks to its use in Dothistroma control. Scion anticipates being able to provide RNC spray recommendations in 2018; these will include information on the economic threshold of infection beyond which spraying is recommended, and the optimum timing of spray applications. Work is well-underway to identify resistant genotypes from current radiata pine breeding populations. Scion will work with the Radiata Pine Breeding Company to produce new, RNC-resistant lines of stock which will be made available to nurseries and hence to forest growers within a relatively short time-frame. Research on how to detect and monitor RNC using imagery from the European Space Agency’s Sentinel 2 satellite is making good progress. Satellite imagery covers very large areas, and is potentially a powerful tool for early disease detection. Sentinel 2 has a 5-day return period, captures data at 10-metre resolution, and the data is free and easy to access. Challenges remain, for example, in identifying RNC-infected foliage specifically, and interpreting colour changes at different stages of the disease. The persistent cloud cover over New Zealand this past winter and spring has proved frustrating for the research team – an unavoidable pitfall of working with satellite imagery. The aim is to establish an automated satellite-monitoring capability, first for RNC and then for other diseases. Semi-automated continuous RNC monitoring will be trialled next season as a step towards this. Better ways of engaging with urban communities and others working in urban pest detection and control. One of the most innovative aspects of the urban pest control programme is the development of ‘Cyborg’ UAV technology to locate pests in trees or other hide-outs. Scion is working with French scientists to develop a pheromone sensor which, when mounted on a UAV, can locate target pests by their odour. So far, a ground-based system has been successful; the next challenge is getting the sensor to work when airborne. Helicopter spot-spraying using a tethered ring-boom appears a promising way of targeting specific trees known to harbour unwanted pests. UAV-mounted sprayers also have very good potential. The way the wake, or down-draft, of the aircraft affects spray dispersal is a critical factor affecting how well these highly targeted spray techniques work. Researchers are developing models to predict and describe wake characteristics, and undertaking operational trials of different technologies. Scion researchers are developing models to explore what happens to an established pest – the European gypsy moth – if its habitat becomes increasingly fragmented. The models describe habitat thresholds – just how much of the pest’s habitat has to be removed for eradication to occur. Developing new ways to communicate with urban communities in areas where risk of pest incursion is high, such as near ports and airports, is a priority. Researchers are working with urban pest monitoring and control agencies to develop new tools to help them better deal with the complex tasks they face. Amongst other approaches, researchers are taking their new technologies, including UAVs, to community meetings, so that locals get a chance to see the UAVs close up, and understand their role in pest control. Myrtle rust, caused by the fungus Austropuccinia psidii, reached New Zealand for the first time in April 2017, wind-borne from Australia to Raoul Island. From here it has moved to Northland, Taranaki, the Waikato and the Bay of Plenty. It is easily spread: spores can be transported on cars, clothing, birds and animals, and tree nursery stock. By mid October 2017 it had been found at some 121 confirmed sites, with the number rising steadily. The rust affect foliage, fruits and flowers of a wide and expanding host range. New Zealand has around 30 native myrtaceous species, including kanuka, manuka, pohutakawa, rata, ramarama and swamp maire. 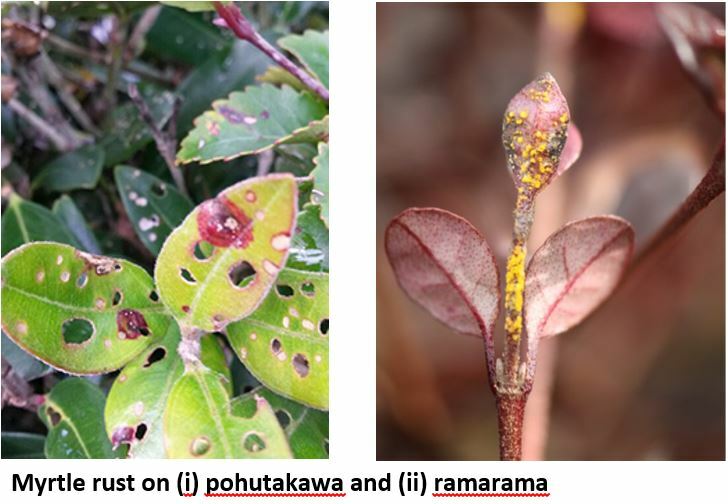 To date (Nov 2017) the most susceptible NZ species appear to be Lophomyrtus bullata – ramarama (57 infected plants found) Metrosideros excelsa, M. kermacadensis and other species – pōhutukawa, northern rātā, and southern rātā (35 infected plants found). Many exotic myrtaceous species also grow in New Zealand, including a number of eucalyptus species. preventing further spread by imposing movement restrictions on nursery stock from certain regions. In time more control options, including chemical control and the identification of resistant hosts, may emerge. Log exports continue to rise, and the environmental impacts of methyl bromide (MBr) are becoming increasingly unacceptable. From 2020, new EPA legislation requires that MBr must be recaptured after use. EDN – the only potential alternative fumigant to MBr (phospine is only accepted by China). EDN is a ‘drop-in’ replacement for MBr, registration is underway, but there is still work to be done on its efficacy and acceptability, especially by China. Risk free periods – a 4-year research programme focusing on an ecological approach – understanding risk by understanding insect behaviour – is in its early days. Joule heating – work by the Electrical Engineering Department at the University of Canterbury has proved the effectiveness of joule heating in killing pests: challenges include upscaling the technique and its potential costs. Debarking – a risk reduction technique rather than a phytosanitary one, and only accepted by China. The problem of waste disposal is significant. Adjusting the use of MBr – research has shown that lower application rates may be possible. Various systems to recapture the gas after fumigation have been assessed, but globally MBr recapture has yet to be achieved at scale. In summary – MBr continues to be an essential treatment for log exports to many countries. It is difficult to destroy or recapture, so alternatives are needed. The most promising fumigant is a chemical – EDN. Joule heating is also considered to have potential. The industry needs time to address this challenge, and support, including from trading partners.